American rock supergroup Hollywood Vampires (Joe Perry, Alice Cooper, Johnny Depp, and Tommy Henriksen) wear custom-made hinged poison rings and necklace medallions from Donna Distefano, shown here in 2016. 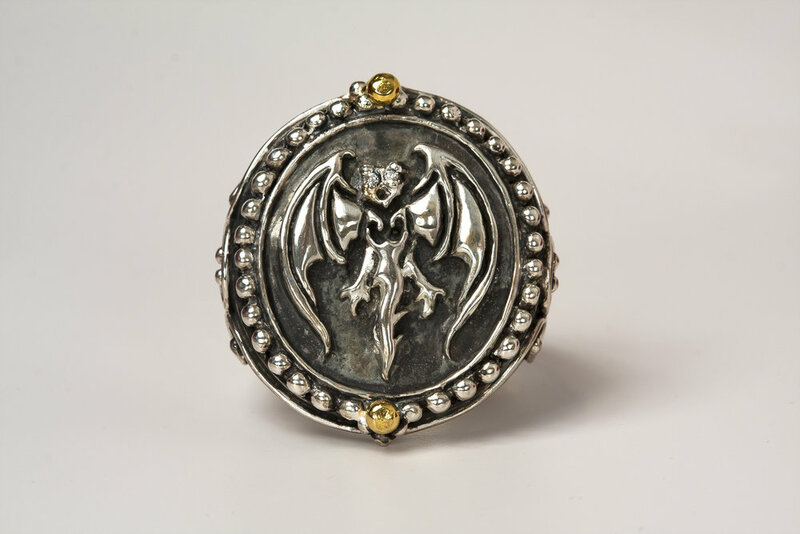 Crafted of precious silver, and featuring rubies, sapphires, and diamonds, the ring features the legendary rockers’ bat logo. In 2017, Marilyn Manson borrowed a ring from the Vampires to wear for the September 2017 magazine cover of New Music Express. The ring also has a prominent presence in his 2017 music video. In November of 2018, Johnny Depp was featured on the cover of British GQ Magazine wearing his Hollywood Vampires custom ring.